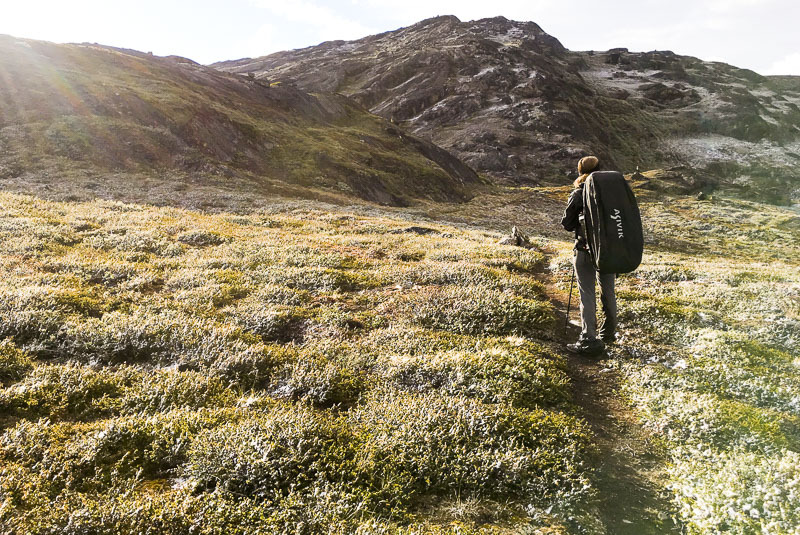 Could you imagine anything more adventurous than hiking in the remote wilderness of Greenland? 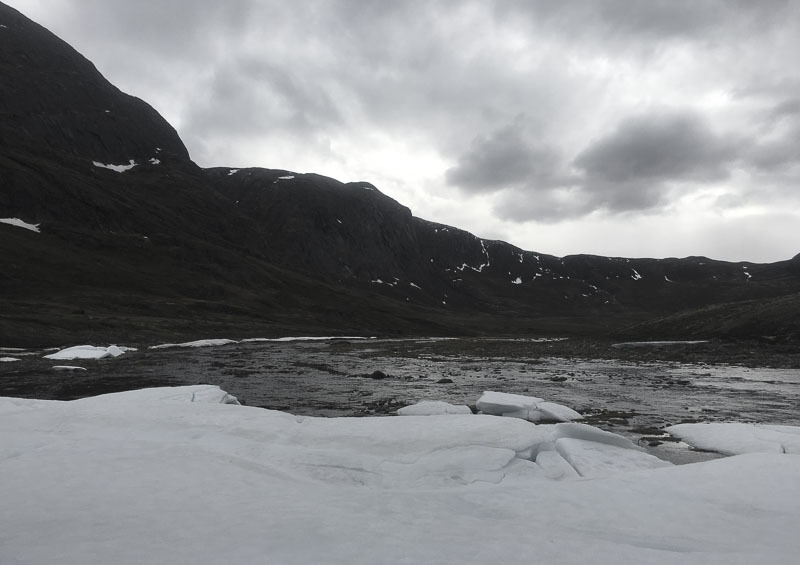 Being completely alone among ice-capped mountains, deserted shrublands, and rushing rivers. Simply, experiencing Arctic nature in all its beauty and remoteness. 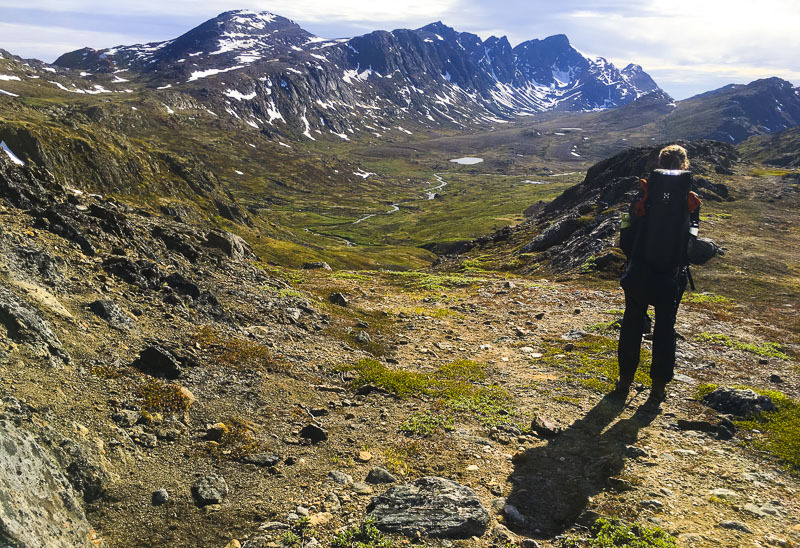 The Arctic Circle Trail offers it all on the 165 km long hiking route that runs between the Greenlandic towns of Kangerlussuaq and Sisimiut. The ACT is an absolute classic among experienced hikers. The terrain is varied and hilly, nature heavenly beautiful, and the trail can be travelled between 7 and 12 days depending on your preferences and fitness. To complete the trail, it requires that you are in good physical shape and are familiar with deserted mountainous terrain. You will need to bring your own food and equipment, while there is plenty of drinking water along the trail from streams, springs, and lakes. Small wooden huts, maintained by the municipality, can provide you with shelter for the night but a tent is strongly recommended. Sometimes you will not meet other people for several days. In the summer of 2017, Kia Skou Jensen and I completed the Arctic Circle Trail (ACT). In this guide you can read about our journey and Greenland’s wild and rugged nature. You will also get some useful advice for your own preparations. On a bright and beautiful morning of June 30, 2017, we arrived in Kangerlussuaq after a four hour flight from Copenhagen, Denmark. Leaving the airport, we had a quick stopover at the local grocery store, Pilersuisoq, and bought some dried fish, rye bread, camping gas (the wrong type we later found out! ), beer, and cola. And then straight away, we headed off for the ACT! In the weeks prior to our departure we spent quite some time and energy packing the best backpacks. We ended up with about 22 kg each, maybe just a bit too much but fortunately, we quickly ate and drank much of it. Our complete packing list is found HERE! Be careful to bring warm clothes (even in the middle of the summer snow and freezing may occur). Also, expect that you will be eating 20-30% more on the trek than you usually do. 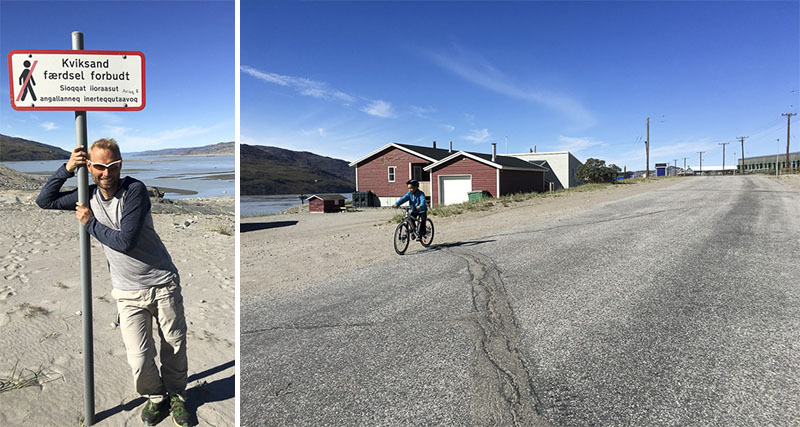 After leaving “down town” Kangerlussuaq, we walked south-west on a long and dusty dirt road, with willow shrubs on our left hand side and abrupt mountain slopes on the right. About 12 km later, we reached the Kangerlussuaq harbour. We felt great and were just completely excited about being in Greenland and on the ACT. We had our backpacks adjusted, while sweating under the bright Arctic sun. Following great views over the harbour, which is actually just a simple pier where tankers and cruise ships tie up, we went uphill to the little community of Kelly Ville, about 200 m above sea level. While we walked I was wondering what the seven inhabitants of Kelly Ville spend their time on. 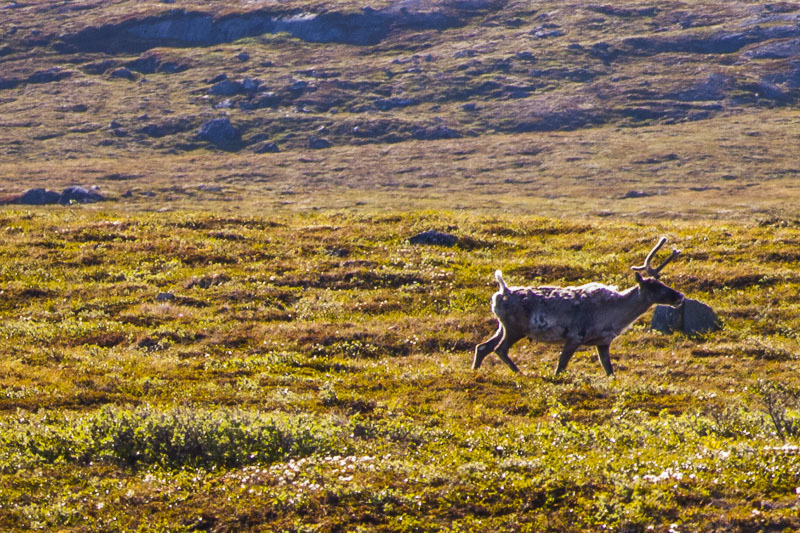 But then we saw the first wildlife on our trek: a playful cat and an off-track reindeer! Kia on the way to Kelly Ville, a community of just seven people. At the bottom right, the run-down sheds at Hundesø. After Kelly Ville the trail started for real and we noted the first cairn and red half-circle symbol, marking the ACT route. A trodden, narrow dirt path led us the remaining 3-4 km to the Hundesø Lake, where an old, run-down ‘caravan’ with primitive sheds attached, became our first shelter for the night. Apparently, the hot day had given rise to a rich insect life and in the evening we were attacked by hordes of mosquitoes and flies – by the way, the only time on our trek that we had this ‘problem’. The water in Hundesø is drinkable though a little salty. As we got ready to prepare dinner we realised that we had bought the wrong type of gas cartridge for our Trangia cooking set. Indeed a stupid move but fortunately, a kind-hearted soul had left a cartridge in the cabin that perfectly matched our Trangia. The night offered a total change of weather and we woke up in the morning to cold rain, sleet, and storm. We didn’t leave Hundesø until late afternoon when the rain and wind had subsided a bit. 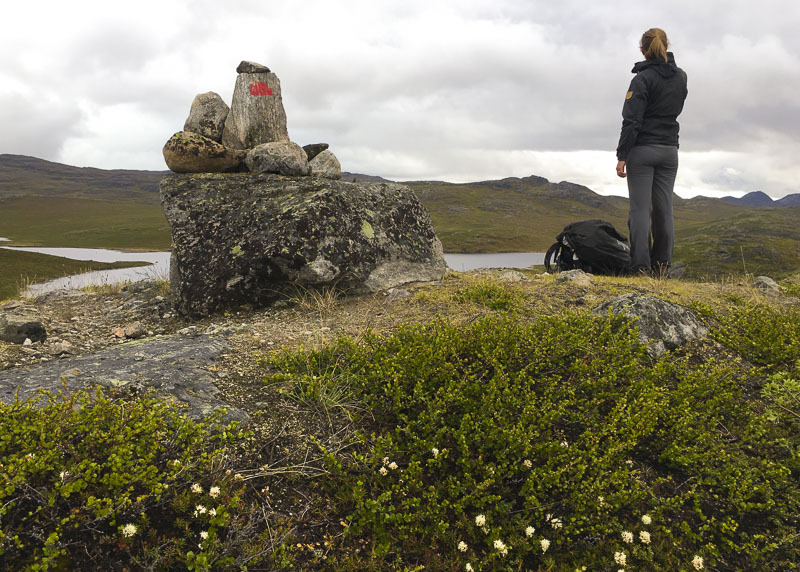 We walked through typical low-Arctic mountain heath with all the character plants such as dwarf birch, willow scrub, black crowberry (berries still unripe), flowering bog bilberry, and the highly fragrant white-flowered marsh labrador-tea. The hiking gave us a good sense of the terrain as we followed narrow trodden paths that occasionally disappeared – up and down, around and beyond rocks and slopes. The vegetation was really wet, so despite covering our feet in plastic bags we quickly got soaked. We were also troubled by occasionally hail and rain. One of ACT’s characteristic cairns with a red semicircle paint mark. We encountered quite some birdlife, including a hunting peregrine falcon, and we almost stumbled over a nest with three chicks of Lapland bunting. After 13-14 km, we crossed a small river, refilled our water bottles, and then forced a longer ascent up to about 300 m above sea level. As we got closer to the hut of Katiffik, the sun finally came out and we had the most stunning view over the mountains and the Amitsorsuaq Lake. We reached the hut around 9 pm, pretty wet, tired, and exhausted. At the hut we met a young Danish couple, who were heading the opposite way of us. In the morning we enjoyed breakfast and coffee and dipped our toes in the Amitsorsuaq Lake. However, it was freaking cold as both air and water were close to zero! Despite the calendar read July 2nd and supposedly it should be summer, it suddenly started to snow. A rising wind made us give up on using the canoe that someone had left at the lake shore. The waves were simply too high. In good weather conditions, however, one can paddle along the entire lake in the (rare) occasion that one of the around 6-8 canoes available is within reach. 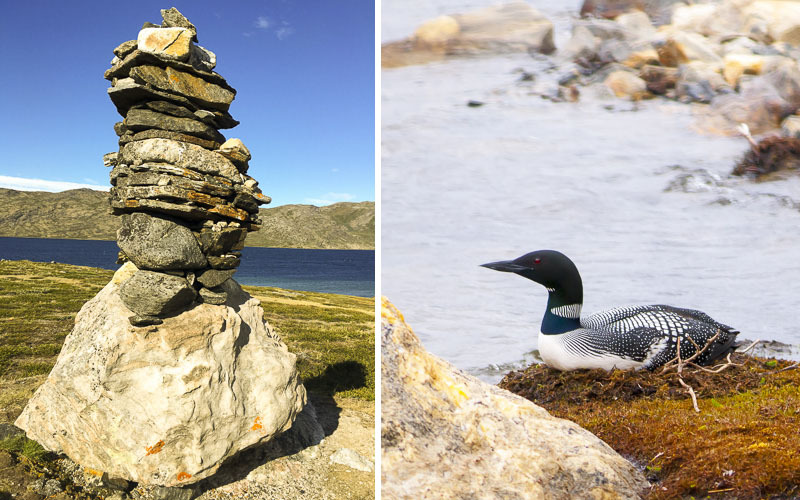 Cairn at Amitsorsuaq Lake (left) and common loon on its nest (right). So we commenced on the 20 km of today’s walk, which largely followed the entire southern shore of Amitsorsuaq Lake. The weather became slightly better as the snowfall faded and the sun occasionally appeared. But we had strong headwinds all the way, so it became a loooooong walk that day along the never-ending lake. But we were not in a hurry and took several breaks to enjoy nature and the silence. We spotted several common loons and dunlins among other birds on the lake, as well as falcons patrolling the air and a lonely reindeer. Finally, we arrived at the Canoe Centre, which turned out to be not just an ordinary hut but a whole dormitory with bunk beds and seating for over 20 people. However, we found it empty for people but felt so great to be there after fighting strong winds throughout a whole day. Early morning we woke up to bright sunshine and no wind – just brilliant! After breakfast we took our chance for a skinny-dip in the ice-cold lake and at noon we left the Canoe Centre following the trail along the bottom of the lake. Approx. 12 km later we reached another big lake, Kangerluatsiarsuaq, which is just 20 m above sea level. We passed a Mediterranean-like sandy beach and above us a white-tailed eagle was scanning the terrain. Afterwards pretty hard ascents followed, where we had to rock climb several times until we reached an altitude of about 350 m above sea level – wonderfully physically demanding! 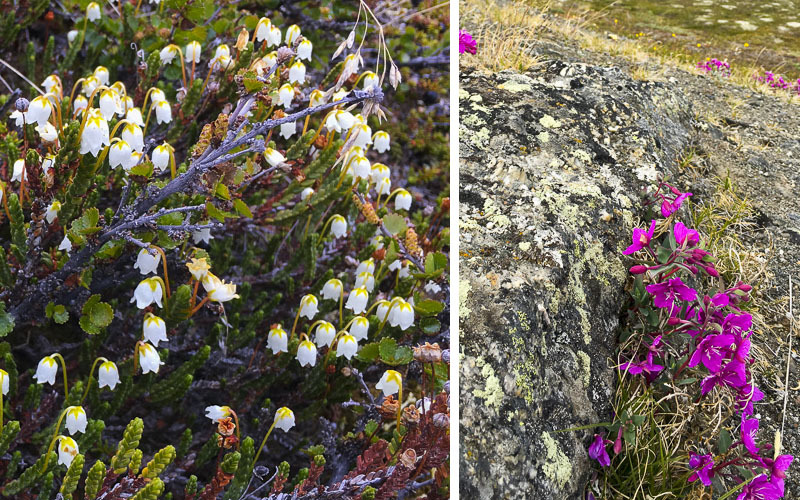 Arctic bell heather in flower (left) and broad-leafed willowherb, Greenland’s national flower (right). The next hut appeared in the distance – a tiny red dot in the landscape. As we got closer, all vegetation looked as if burned and when we arrived at the hut, our observation was confirmed when reading people’s notes in the guestbook. In August 2016 a wildfire had raged for several weeks, burning down scrubs, peat, and mosses. Luckily, the small wooden hut did not set on fire, even though the vegetation all around was burned down. Vegetation slowly recovering after an extensive peat fire in the area in the summer of 2016. We fetched some water in the nearby Ikkarlutooq Lake and prepared dinner – hot tomato soup with couscous and fried mushrooms we had picked earlier together with tofu and rice. During the night the weather once again turned unfriendly and at 4 am we woke up to the sound of a snowstorm! Outside the hut heavy snowfall had started and a strong wind was rising from the west. The bad weather lasted all morning and all through the day. As we didn’t really want to continue in this kind of weather, we just stayed in the small hut without much to do other than getting some rest. But then it cleared up and at 8 pm we finally left the hut at Ikkattooq. We walked through a beautifully snowy mountain landscape, bathed in the low sun and with dwarf birch and bog bilberry scrubs peeking out of the snow. The wind calmed and we had magnificent views of the Pingu mountain and other snow-covered peaks. After walking another 5-6 km, a pleasant but sometimes steep descent of approx. 400 altitude metres led us down to a low-lying valley through which Ole’s Lakseelv is flowing. When we reached the river, we decided not to ford it as the water stood pretty high (and was freezing cold) so instead we walked about 3 km downstream until we reached a small wooden footbridge as described in Paddy Dillon’s guidebook. We crossed Ole’s Lakseelv at midnight. Scores of Arctic char were swimming in the river but none of them wanted to bite on my spinner lure. I even tried to catch a char with my bare hands in true Greenlandic style by grabbing the fish behind its gills. And I almost made it but unfortunately it slipped, so no fish that day! The sun eventually disappeared behind the mountains and the frost set in. It was actually really nice to walk on squeaking icy bogland and at 2 am we arrived happily at the hut at Eqaluagaarniarfik. No people around and freezing cold inside, just like the previous nights. We woke up to stunning views of the valley and the Maligiaq Fjord. Under a partly cloudy sky, we left the hut at noon and followed the trail upwards to approx. 450 m above sea level. Then, a really nice walk followed with one picturesque view after another. Rock ptarmigan in summer plumage. In contrast, it’s completely white in winter making it perfectly camouflaged in the snow. On the way we watched rock ptarmigans, Greenland’s only landfowl, and along one of the rivers last winter’s snow and ice had not melted yet. It looked like someone had spread giant blocks of inland ice over the landscape. At Innajuattoq we spotted a little hut on a mountain top. Like a deja vu, it took us a lot longer to reach the hut than expected. It felt like we were walking for hours – snail pacing through boggy land and obstinate scrubs. It was tough and we were hungry like horses when we finally reached the hut. On this day’s hike, we chose to combine two stages as we had to be on time to catch the Sarfaq Ittuk ferry in Sisimiut and also expected the terrain to be relatively easy according to Paddy Dillon’s guidebook. But nothing is really easy on the ACT and it turned out that we both had to go rock climbing and wading through countless boggy parts before the day was completed. After a morning dip in the icy lake, we went on in shorts and under a clear blue sky. The weather was finally with us – all day! After about 5 km we passed a series of small lakes on the left hand side and lush south-facing herb-slopes – also called “urtelier” – on the right hand. Here we encountered the most species-rich flora so far and if I’d had the time, I would probably be able to count well over 50 different plant species (see also PLANTS). And in the air, the only two butterfly species found in Western Greenland, the orange and black-stained Arctic fritillary and the pale-yellow Northern cloudy yellow, were circling around. What a scenery! A rare sight – other people! And a butterfly – the Arctic fritillary. Later we met several hikers coming towards us, which was a new experience as until then we had rarely met people on the trek. Delightful hiking continued until we reached the Nerumaq hut at around 5 pm. We prepared a quick meal and rested for a short while. Ready to move on, we forded yet another river and the terrain went on alternating between boggy ground and dense shrubs. As a result our pace dropped equally. At one point we went through the tallest willow scrubs that I have ever seen in Greenland – over 3 metres high, almost like a real forest. We followed the trail for another 5-6 km and reached a very lively river, cutting through a bouldery gorge. We had completely lost the trail and couldn’t find a safe place to ford the river, so we decided to follow it downstream. However, this was a pretty risky move and in a quite amateurish way we climbed up and down the steep cliff sides, while almost deafened by the loudness from the river. Finally we found a way to escape the gorge by climbing upwards until we were “safe” on the ridge of the gorge. These are the situations where you, tired and in unknown terrain, have to be extra careful not to do anything heedless (such as stumble and fall into a rushing river). Willow scrub (left), bog moss (middle), and sandy beach (right). More swampy and wet valley terrain followed along the same river until we reached a larger lake. In the low midnight sun we then walked the last few kilometres alternately on sand and through bogs and shrubs. At one point I felt totally exhausted close to collapsing, while Kia just went on at full speed. 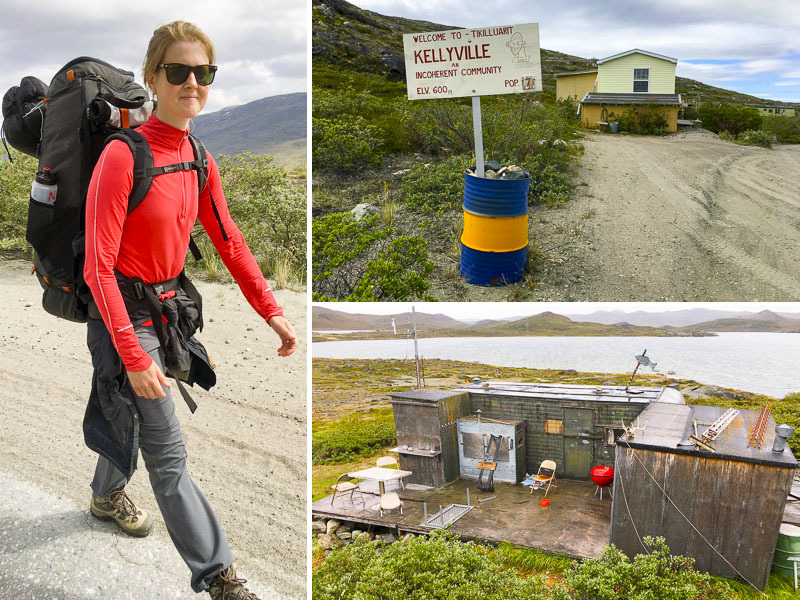 We finally reached the hut for the night, located at the bottom of the large Kangerluarsuk Tulleq Fjord. Unfortunately, we woke up two people in the hut, who turned out to be a father and son working for the municipality to maintain the trail and the huts. Waking up to nice and sunny weather, we enjoyed our last supplies of muesli and instant coffee before commencing on the final day of our ACT experience. And what a beautiful day! The climb up the ascent to the Qerrortusup Majoriaa valley, about 400 m above sea level, felt just great with amazing views of the mountains and the Kangerluarsuk Tulleq Fjord. After 7-8 kilometres of comfortable walking, we got a splendid view towards a ‘fairy-tale’-looking valley flanked by steep mountain slopes with the peak of the Kællingehætten as the most significant. At the bottom of the valley a river was bending its curves and the whole panorama was like a scene from the Lord of the Rings. But it was real and that day is now safely kept in my memory as one of the most mesmerizing sceneries. Mythical land, as taken out of the Lord of the Rings. 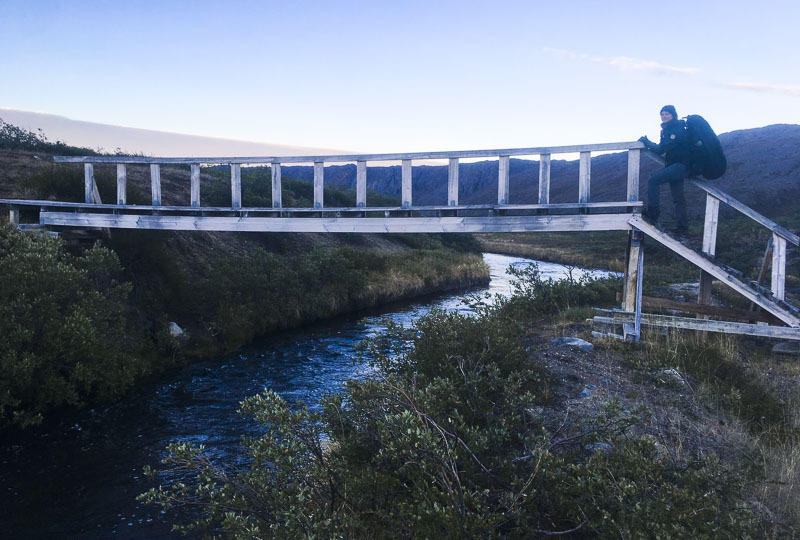 The Arctic Circle Trail is located on the western coast of Greenland connecting the towns of Kangerlussuaq and Sisimiut. There are no roads between the towns. The ACT is 165 km long and extends in an east-west direction approx. 70-80 km north of the Arctic Circle. As the area has midnight sun in the summer – from the beginning of June to mid July – it is possible to walk at any time during the day. In contrast, it is totally dark almost 24 hours a day in the winter. Complete darkness, however, will not occur as the sun will not descend below the horizon as further north in Greenland. Like most of Greenland, the area is mountainous and without trees. Along the ACT you will walk across mountain ranges of up to 5-600 m above sea level, while the highest peaks in sight reach 1,500 metres. The biggest mountains are covered in snow and ice all year round. Kangerlussuaq is located at the bottom of the fjord with the same name approx. 30 km west of the Ice Cap and approx. 160 km east of the coastline, where Sisimiut is located. About 500 people inhabit Kangerlussuaq, most famed for hosting Greenland’s only international airport. There is a small supermarket near the airport, where you can buy the most necessary goods, as well as a variety of souvenir and trekking shops. With its 5,500 inhabitants Sisimiut is Greenland’s second largest town and a hotspot of education, commerce, fisheries, and a growing tourism industry. 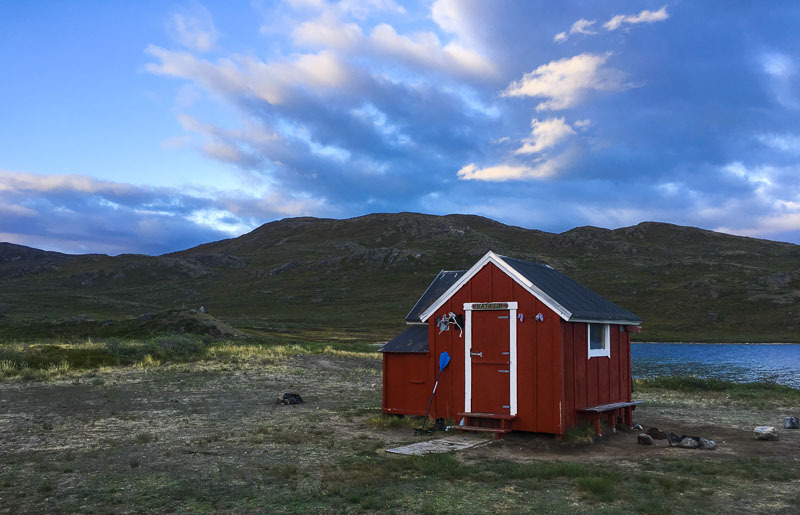 Sisimiut has a broad range of services, including hotels, a youth hostel, museums, cultural centres, and excellent opportunities for hiking, boat trips, whale watching, and much more. The climate in the area gradually changes from a dry, Arctic continental climate in the area between Kangerlussuaq and the Ice Cap in the East to a more precipitous, coastal zone climate around Sisimiut in the West. At the coast, the annual rainfall is typically 500 mm, while it’s less than 150 mm at Kangerlussuaq. The large climatic variation is also reflected in the temperature, where the monthly average temperature in the summer is approx. 10-11 ° C in Kangerlussuaq towards approx. 6 ° C in Sisimiut. In the winter months, the average temperature drops to minus 20 ° C in Kangerlussuaq, while it is somewhat higher (minus 12-14 ° C) in Sisimiut. The dry continental climate at Kangerlussuaq and towards the edge of the Ice Cap makes the vegetation sparse, characterized by dwarf-shrub heath, grass-steppe and in some places even sandy and desert-like. Further towards the coast and on most of the ACT route, the climate is more humid and the vegetation hence more varied and lush, defined by a high diversity of shrubs, low-Arctic flowers, and wet mosses. Characterized by its location just north of the Arctic Circle, the biotope in the area is both harsh and generous. The long winter with snow, ice, and extreme cold makes it difficult for mammals and birds to feed, while the short bright summer offers an intense growing season for plants, which in turn provide food for many insects and animals. The natural vegetation along the ACT course consists mainly of mountain heath with dwarf shrubs, heather, and low-Arctic herbs and flowers. Typical plants are dwarf birch, black crowberry, bog bilberry, bell heather, and blue heath. Where conditions are most fertile, willow scrub grows up to a few metres high and is the closest it gets to “forest”. 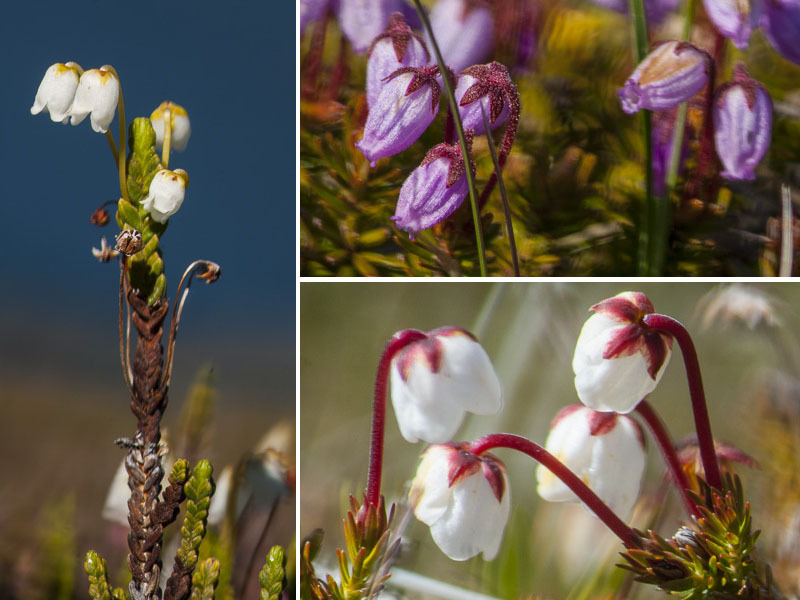 Three species of heather: Arctic bell heather (left), blue heath (top right), and moss bell heather (bottom right). The Greenlandic flora comprises 510 native species, and at least one third of them are found in the area along the ACT. For example, you may experience the purple-flowered broad-leafed willow-herb, Greenland’s national flower, or the highly aromatic white-flowered marsh labrador-tea. Particularly astonishing are the herb-slopes or “urtelier”, which are south-facing lush mountainsides that in the short summer are bathed in the low Arctic sun for most of the day. Here, one can often find more than 50 plant species, including a few orchid species such as Northern green orchid and heartleaf twayblade. 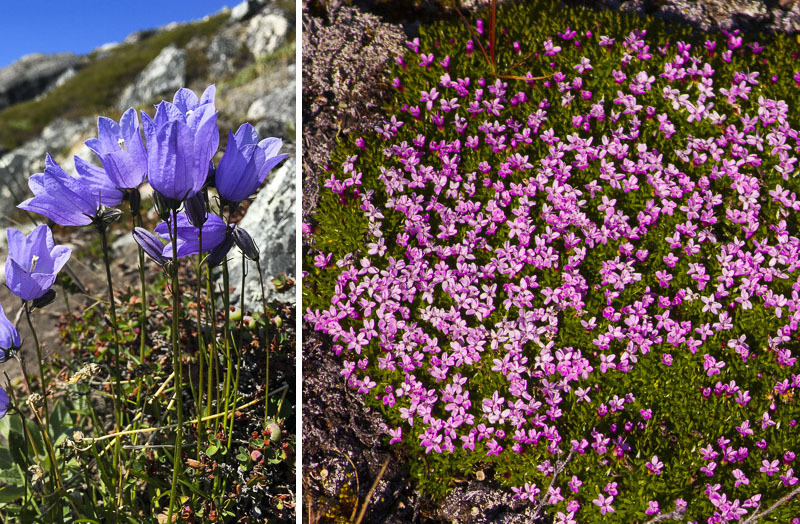 Greenlandic bluebell (left) and moss campion (right). Along the ACT course are four types of edible berries that can be picked from August: Black crowberry, bog bilberry, lingonberry, and common bearberry. Black crowberry – or just crowberry – is especially numerous and a healthy and tasty though slightly bitter supplement to the diet. Bog bilberry – also called Arctic blueberry – looks a bit like common blueberry and is almost as sweet but has white pulp. Lingonberry and common bearberry can be difficult to distinguish from each other, because of their similar red berries, but the latter has a more ‘floury’ and less attractive taste. 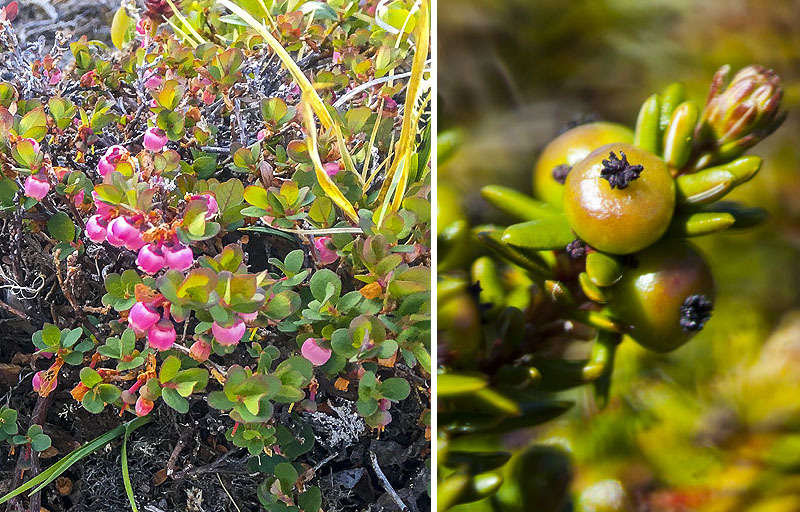 Bog bilberry in flower (left) and green unripe berries of black crowberry (right). On cliffs and rocks where plants are rarely taking root, a rich abundance of mosses and lichens are prevailing. Mosses dominate where it is sufficient moist, while lichens can adapt to even long periods of dryness. 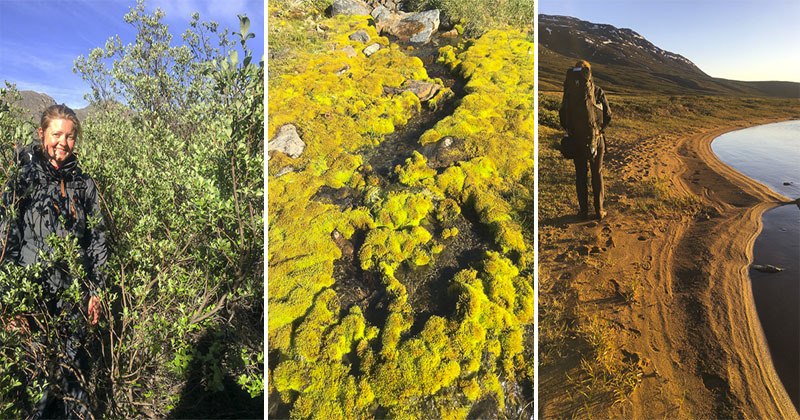 There are about 1,100 moss species in Greenland and the green, yellow, brown, and sometimes almost illuminous carpets of mosses is a dominant landscape element anywhere along the ACT. The lichens are also eye-catching in orange, yellow, green, and greyish colours. It is actually a double-organism, consisting of a fungus in symbiosis with a green algae. Of the 950 lichen species registered in Greenland, about two thirds live on rocks and cliffs and one third in soil and on plants. Greenland is home to at least 700 mushroom species. On the ACT course, birch bolete and other species of boletus are common and all edible when cooked. 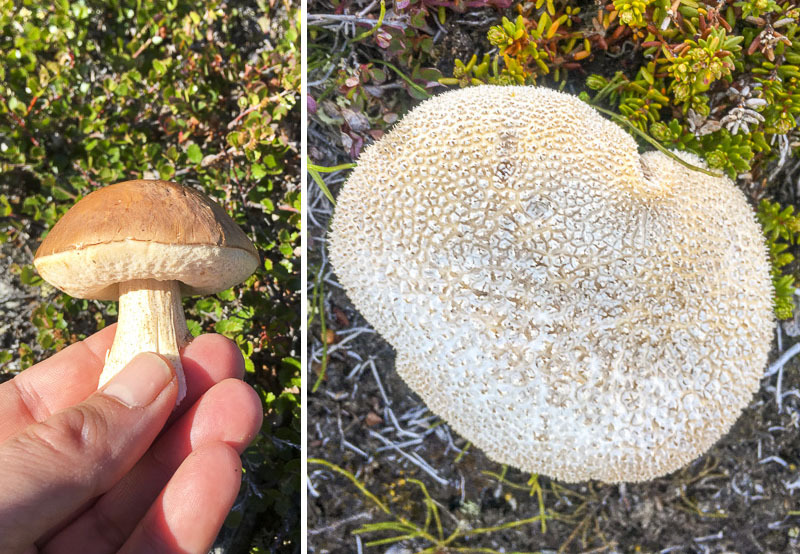 There are no poisonous mushrooms in Greenland, so you can safely pick them. Birch bolete (left) and puffball (right), both perfectly edible and tasty. As in most of Greenland, the cold winter gives harsh conditions for wildlife and land mammals are low in number. 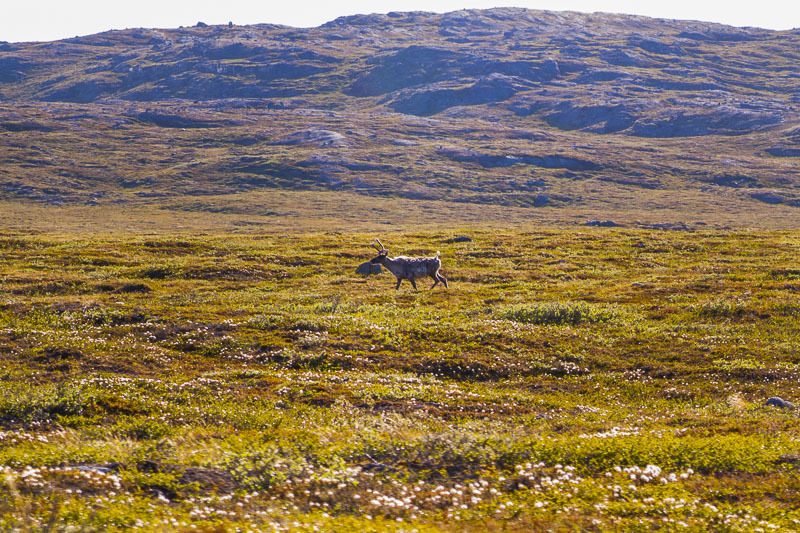 However, reindeer, Arctic fox, and Arctic hare are common along the ACT and herds of musk ox can be seen on the steppes around Kangerlussuaq. Arctic wolf and polar bear do not occur in this part of Greenland. The reindeer is often found in herds, which may vary in size and distribution from year to year. It survives the winter by – as the only mammal – eating lichens, especially reindeer lichen, which it digs out of the snow with its hooves. The large woolly musk ox is originally from North-East Greenland but has been introduced by man in several places in West Greenland, particularly on the plains near Kangerlussuaq, where today it numbers several thousand individuals and is – as the reindeer – a favourite game meat. Along the trail, small birds like snow bunting, common redpoll, and Lapland bunting are commonly seen. The raven is visible all year round – often circling over the mountains looking for food like carrion, chicks, eggs, or even human waste. The distinctive rock ptarmigan can often be observed and for the persistent there are good chances of spotting birds of prey like white-tailed eagle, peregrine falcon, and gyrfalcon. Common redpoll (left) and snow bunting (right). With flies and mosquitoes as notable exceptions, insect life is generally modest in diversity. 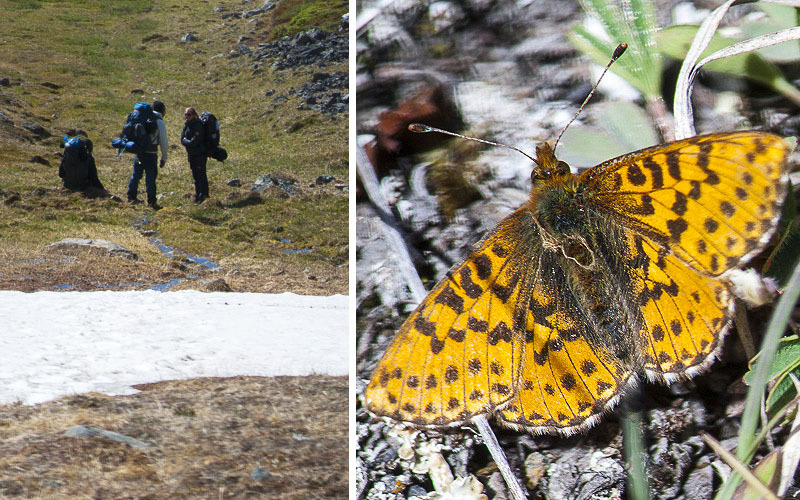 For butterflies, only two species are found: Arctic fritillary with orange wings and a characteristic pattern of black spots and northern clouded yellow with beautiful yellowish wings. They both fly in June to August and are found in arid flowery areas. In total, several hundred insect species are found in the area, including moths, beetles, and spiders. Toothbrush, toothpaste, sun cream, etc. Our full supplies – click for larger image! 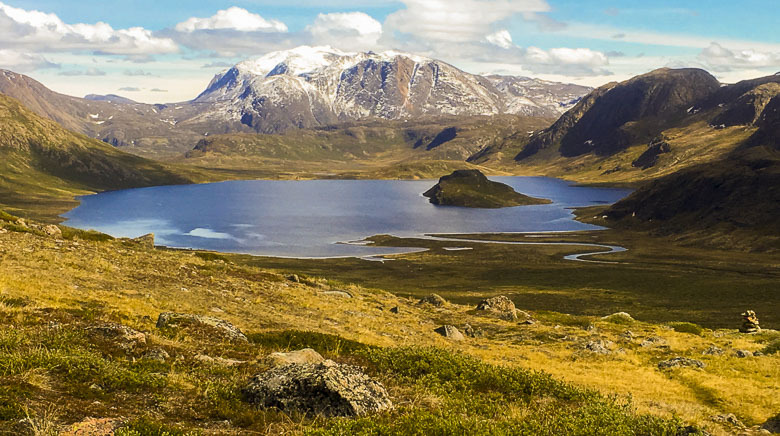 Trekking in Greenland: The Arctic Circle Trail. By Paddy Dillon. 128 pages. Cicerone Press, 2010. 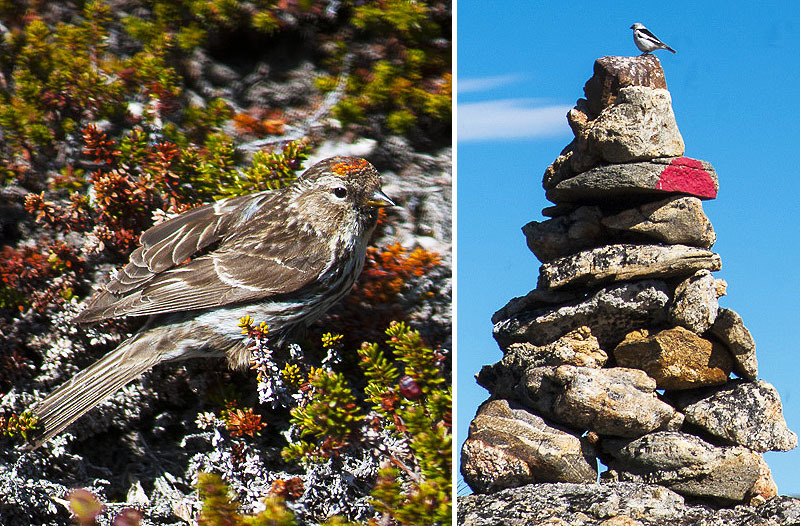 A Nature and Wildlife Guide to Greenland. By Benny Génsbøl. 260 pages. Gyldendal, 2004. Wild Flowers of Greenland. By Flemming Rune. 350 pages. 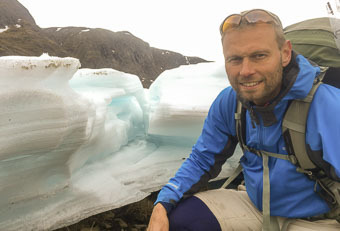 Gyldenlund Nature Publishing, 2011. 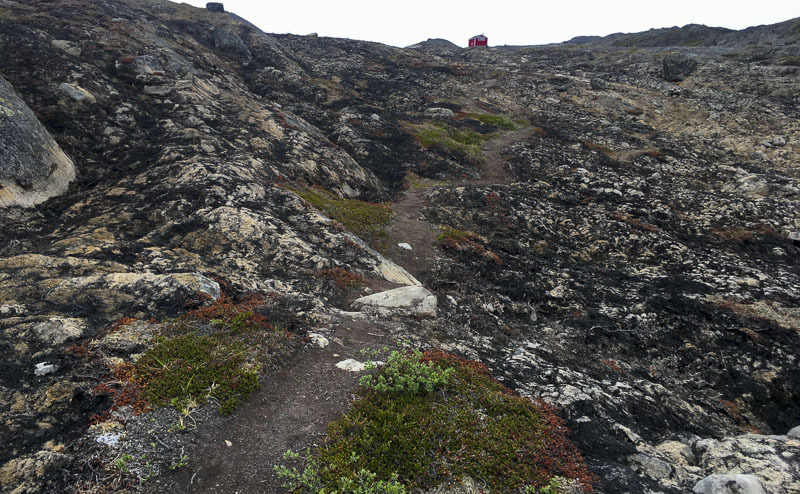 Trekking the Arctic Circle Trail in Greenland. Online guide by Matthew Karsten, 2015. Grönland: Arctic Circle Trail. Outdoor Handbuch, 160 pages. Conrad Stein Verlag, 2014 (in German). Greenlandic Seasons: Nature and Climate in the Disko Bay Area. By Bo Normander. 192 pages. Nature & Environment Publishers, 2016.